At TDLR, we strive to be the best and provide you with exceptional customer service. We take this commitment seriously. In recent weeks, we have fallen short of our own standards. I want you to know that I’m aware of this, and that we have made improvements in our service. We will continue to do better. We have faced several technological glitches so far with the transfer of programs from Department of State Health Services. That’s not an excuse, but just the plain fact. Software problems beyond our control have resulted in log-on issues for some of you, and longer than normal wait times on the phone. In response to these challenges, we reconfigured our contact center operations to change the way we respond to rising call volumes. We’ve extended our working hours during the weekday and on the weekends, and we’re calling customers back later in the evenings and on Saturdays to help them. For log-on issues, our team members are calling people to walk through the step-by-step process over the phone and get their problems resolved. We are working with our software vendor to implement a permanent software solution going forward. The best time to call us is early morning. We open at 7:00 AM and are available until 6:00 PM Monday through Friday. If you email us for help, please include your name, contact number (for follow-up), license number (if you have one), and the issue you need help with. If you have an existing DSHS User ID and password, do not create a new account. If you forgot your User ID or password, click "Forgot User ID?" or "Forgot password?" under "Returning User." Please note: TDLR’s Strategic Planning will get underway this spring, and because your voice matters to us, we need to hear from you to help us learn how we can improve. As part of this process, we will hold face-to-face external sessions around Texas, and post questions and surveys on Facebook and Twitter. More information will be coming soon about Strategic Planning, and I look forward to hearing and reading your thoughts, ideas, and comments. Serving you is our number one priority, and rest assured, we’re going to continue to do better and better. TDLR recently welcomed five new advisory boards to the medical and health professions family. With the completion of the transfer of programs from the Department of State Health Services (DSHS), the transfer of medical podiatry, and the addition of behavior analysts licensing, TDLR is already benefiting from the insight, experience, and advice of the professional and public members who volunteer to serve on our new advisory boards. TDLR held an educational summit for the newly formed advisory boards on November 8-9, 2017. In addition to Behavior Analysts, members of the Code Enforcement Officers, Massage Therapy, Podiatric Medical Examiners, and Registered Sanitarian advisory boards and committees received a full overview of the agency and all relevant laws and rules. 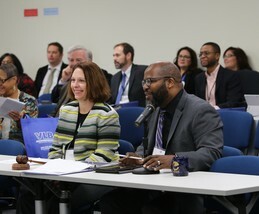 In day-long training sessions, members received updates from the Executive Office; Office of Strategic Communication; Compliance; Education and Examination; Enforcement; Field Operations; Licensing; and the Advisory Board Support Team. The General Counsel’s office provided training on the Administrative Procedure Act, the Open Meetings Act, and the Open Records Act. The new members also learned about TDLR’s functional alignment and our Core Values. Keep up with the latest meeting information on the TDLR Meetings page. On September 1, 2017, TDLR began issuing licenses and performing all regulatory duties associated with the Podiatry program. In transferring the regulation of podiatric medicine to TDLR, the Texas Legislature adopted several recommendations to provide institutional stability and administrative savings, improve licensing and enforcement outcomes, and better protect the people of Texas. 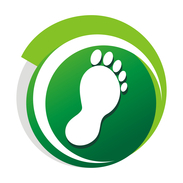 All Podiatry licensing applications are now available on the TDLR website. Applications were streamlined and notary requirements removed. The Doctor of Podiatric Medicine jurisprudence exam is now offered via computer-based testing at PSI exam sites nationwide & statewide. The exam is offered daily and candidates are no longer required to travel to Austin. Additionally, the jurisprudence exam fee has been reduced from $250 to $60. Improvements are also being made to the regulation of Podiatric Medical Radiological Technicians. TDLR would like to recognize the important work done by our team members who were previously with the Texas State Board of Podiatric Medical Examiners: Hemant Makan, Christine Riffe, and Veronica Coronado. Their hard work and dedication ensured we had a smooth and successful program transition. Governor Greg Abbott appointed six members to the Podiatric Medical Examiners Advisory Board on November 30, 2017. The advisory board provides advice and recommendations to TDLR on technical matters relevant to the regulation of the practice of podiatry. 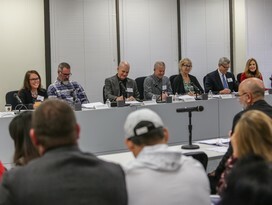 The board held their initial public meeting on January 29, 2018 (watch on YouTube). At the January meeting, the board recommended two rule packages for publication to the Texas Register, and appointed four workgroups for issues involving enforcement; licensing; education and examinations; and standards of care. The next board meeting is tentatively scheduled for April 16, 2018 in Austin. For more information on the Podiatry program, please visit the Podiatry home page. In November 2017, the Mold Assessors and Remediators program transferred from the Texas Department of State Health Services (DSHS) to the Texas Department of Licensing and Regulation (TDLR). As part of the transfer to TDLR, the mold notification process has been updated. In the past, DSHS required licensees to mail or fax written mold notifications, amendments and cancellations. At the conclusion of the remediation project, DSHS mailed an invoice for the notification fees. TDLR has created an online notification system for mold notifications and fees to make submissions and payments quicker and more efficient. To file, amend, or cancel a mold remediation notice or emergency mold remediation notice, please go to TDLR's Mold Remediation Notification System. Only licensed Mold Remediation Companies and Mold Remediation Contractors should access the online system. First time users must register and create an account. It’s important to remember your user name and password to update and track the history of any notifications that you file. The fee for residential and commercial remediation projects is $25. There is no fee to amend or cancel a notification. If you filed a notification with DSHS before November 1, 2017 and need to amend or cancel it after November 1, 2017, please contact TDLR at CS.Mold@tdlr.texas.gov. TDLR recently revised and updated the Licensed Midwives Informed Choice and Disclosure Form. The revised form, created in collaboration with the Midwives Advisory Board, includes a new requirement to provide information to prospective clients on hospital transfer. It is available in English and Spanish. The new form includes two spaces to list the hospitals to which a client will be transferred. If there are more than two hospitals to which the client might be transferred, a separate page can be attached to the form listing the hospitals. This list can't be a generic list of all hospitals in the area – it should be tailored to the planned birth location of each individual midwifery client. In addition to the changes to the disclosure form, the Texas Midwifery Basic Information and Instructor Manual is now available in Spanish. You can find these TDLR publications on the Midwives Forms page at: https://www.tdlr.texas.gov/midwives/mwvforms.htm. In May 2017, TDLR announced a new online system for reporting changes in supervision of speech-language pathology assistants and interns. TDLR staff from multiple divisions worked together to create the new online system for licensees’ ease and convenience. Since the online system was launched, 7,655 supervisory records have been added, deleted or changed. Previously, the department-approved supervisor had to submit a Supervisory Responsibility Statement to notify the department of any changes in supervision of a speech-language pathology assistant, or an Intern Plan of Agreement and Supervision to notify the department of any changes in supervision of a speech-language pathology intern. The forms had to be printed, completed, and sent back to TDLR for processing and approval. This process could take several days or weeks. The new online system is used in place of submitting paper forms. Licensed speech-language pathologists who are eligible to supervise can log-in to their online licensing accounts to add or delete assistants and interns who are currently licensed. Supervisors may not add or delete applicants who have not yet been issued a license. When using the online system, the changes made by the licensed supervisor are immediate. Supervisors may print out a summary of their current assistants and interns as soon as they make any changes. Please visit the Speech-Language Pathologists and Audiologists homepage to access the online system, find detailed instructions for the online system, and view frequently asked questions (FAQs) concerning supervision. Each TDLR licensing program has its own homepage, accessible from www.tdlr.texas.gov. From the program homepage, you can find valuable information on continuing education, forms, rules, frequently asked questions (FAQs), and more. The FAQs for each program are categorized, which allows users to quickly find answers. The FAQs were developed based on questions received by our customer service representatives and questions we receive while conducting outreach activities. FAQs are updated on a regular basis to reflect current questions and to give updated information on existing questions. Q. When do I need to post my massage therapist license so that it is visible to the public, and when can I just carry my wallet card? A. You need to post your license at your primary office or place of employment and at any licensed massage establishment where you provide services. TDLR will inspect licensed massage establishments for compliance with the Texas Occupations Code requirement, so you may need to order a duplicate license if you work at more than one massage establishment. See Sec. 455.204. Display of License. You may carry just your wallet card when providing massage therapy services at other locations, such as public or charity events. You may post or carry only original licenses issued by DSHS or TDLR, not copies. 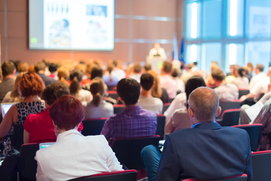 This spring, TDLR staff will be available at a number of conferences and meetings across Texas to provide licensing and program information to attendees. We hope to see you at one of these events! TDLR’s Medical and Health Professions staff are available to provide informational presentations and/or staff booths at your next conference or meeting. If you would like a TDLR representative at your next conference or meeting, contact us at: Compliance.Health.Professions@tdlr.texas.gov. Do you need a verification of your license? You can do that online. The link can be found on the right side of your profession’s program webpage, or you can go directly to https://www.tdlr.texas.gov/verify.htm. You can also search for a license by name, profession, or license number. It’s quick, easy, and always available! Proposed administrative rules for the Behavior Analysts program were filed with the Texas Register February 2, 2018 and will be open for public comment until March 5, 2018. See the proposed rules. Adoption of the rules by the Texas Commission of Licensing & Regulation is anticipated in late March 2018, with an effective rule date of May 1, 2018. Behavior analysts and assistant behavior analysts will be able to apply for a license with TDLR beginning June 15, 2018. Comments on the proposed rules may be submitted by mail to Pauline Easley, Legal Assistant, Texas Department of Licensing and Regulation, P.O. Box 12157, Austin, Texas 78711; by fax to (512) 475-3032, or by email to erule.comments@tdlr.texas.gov. Be sure to sign up for email updates to find out the latest news, and keep an eye on the Behavior Analysts program webpage for more information and FAQs. If TDLR has legal authority over the alleged violation, a case is opened and assigned to an investigator. If TDLR does not have legal authority over the alleged violation, the complaint is closed for lack of jurisdiction. In cases involving a standard of care allegation, an expert witness will be utilized. 3. An assigned prosecutor reviews the facts of the case to determine whether it is appropriate to propose disciplinary action. Where do the complaints come from? TDLR resolves more than 78% of complaints within six months. Informal resolutions can include closing a case for insufficient evidence, or issuing a warning letter. The case can also be closed with a formal disciplinary action such as an administrative penalty (fine), and/or suspension or revocation of a license. What if an applicant or licensee wants to appeal a proposed disciplinary action and requests a hearing? When a proposed enforcement action leads to a hearing, the prosecutor presents TDLR’s case to the State Office of Administrative Hearings (SOAH) and the Texas Commission of Licensing and Regulation. SOAH hearings are open to the public unless they are confidential, and are listed on SOAH’s website at: http://www.soah.texas.gov/index.asp. Commission meetings are broadcast live on TDLR’s YouTube channel, and recorded meetings may be viewed at: https://www.tdlr.texas.gov/meetings.htm#prevtclr. You can file a complaint online for most TDLR programs at the following link: https://www.tdlr.texas.gov/complaints/. You will be asked to choose whether you are filing a complaint against a licensed or an unlicensed person or business. If you are unsure about whether the person or business holds a TDLR license, use the unlicensed link. Some medical or health-related programs require you to submit a complaint form by fax or mail, due to the risk of transmitting confidential health information electronically. The online system will direct you to print out a complaint form in .pdf format if one is required. If your complaint does not allege a violation of the law or rules, or does not include sufficient information for TDLR to investigate the allegations, TDLR will not open a complaint. Read more about TDLR's complaint investigation and resolution process. To find disciplinary actions taken on complaints filed with TDLR for your program, go to: https://www.tdlr.texas.gov/cimsfo/fosearch.asp. You can search by name, license number, location, or by program. All disciplinary actions posted on the TDLR website are final actions taken by TDLR. No actions taken by previous licensing boards or agencies are included. For information on why specific violations of the law or rules might fall into a certain penalty range, please see TDLR's Enforcement Plan at: https://www.tdlr.texas.gov/enforcement.htm. You can also find license denials and revocations. If an application denial is based on criminal history, you can find information on why that criminal history was relevant in the program’s Criminal Conviction Guidelines at: https://www.tdlr.texas.gov/crimconvict.htm. Can’t find the Enforcement Plan and/or Criminal Conviction Guidelines for your program? If no Enforcement Plan or Criminal Conviction Guidelines are posted, that may be because the Texas Commission of Licensing and Regulation has not yet voted to approve these documents for your program. Subscribe to TDLR’s Email Updates to receive important information about programs of interest and upcoming Commission and board meetings, including meeting agendas: https://public.govdelivery.com/accounts/TXDLR/subscriber/new. Did you miss a recent meeting of the advisory board for your profession? You can find links to the videos of those meetings on the TDLR website, but you can also find them by visiting TDLR’s YouTube channel. Our channel has playlists of every advisory board meeting, as well as meetings of the Texas Commission of Licensing and Regulation. Go to https://www.youtube.com/texaslicensing to subscribe and check out the latest meeting videos. Unless otherwise noted, TDLR Commission meetings and all advisory board/committee meetings are held in in the 1st Floor Public Meeting Room at TDLR's North Campus, 1106 Clayton Lane, Room 125E, Austin, TX 78723. All public meetings are broadcast and archived on TDLR's YouTube channel. Meeting notices, agendas and staff reports are posted on the TDLR Meetings page. The Texas Commission of Licensing and Regulation is scheduled to meet Tuesday, February 20, 2018 at 8:30 a.m. The agenda is posted online. The Orthotists and Prosthetists Advisory Board is scheduled to meet Friday, February 23, 2018 at 10:00 a.m. The Massage Therapy Advisory Board is scheduled to meet Monday, February 26, 2018 at 1:00 p.m. The Dietitians Advisory Board is scheduled to meet Tuesday, February 27, 2018 at 1:00 p.m. The Speech-Language Pathologists and Audiologists Advisory Board is scheduled to meet Tuesday, March 6, 2018 at 1:00 p.m. The Behavior Analyst Advisory Board is scheduled to meet Friday, March 16, 2018 at 9:00 a.m. The Midwives Advisory Board is scheduled to meet Monday, March 19, 2018 at 1:00 p.m. The Hearing Instrument Fitters and Dispensers Advisory Board is scheduled to meet Wednesday, March 21, 2018 at 10:00 a.m. The Dyslexia Therapists and Practitioners Advisory Committee is scheduled to meet Tuesday, April 3, 2018 at 10:00 a.m. Questions? Post them on TDLR's Facebook page, tweet us or email customer.service@tdlr.texas.gov.